The team at Island House Vacation Rentals was great. They had everything covered, from our transportation to and from the airport to the accommodation of a late check out. Plus, they gave us great recommendations for activities to do while in Roatan. Highly recommend enjoying the cooking of Chef Blackie and Marty. Delicious! It was so great having Yoni and Mino on site. They were so helpful and pleasant. Sunset House was amazing. The house and property had everything you need for a fun and relaxing vacation. The paddle boards, snorkeling gear, the margarita maker, the outdoor bar....it was so hard to come home. Even the rain couldnt stop the fun. The covered area with ping pong table and shuffleboard provides hours of entertainment and laughs. We cant wait to come back. I cannot thank all of you enough for all your help during our stay. A special shout out to Fernando, Shanna, and Julio for assisting us throughout our stay. I always felt like I had a friend who was willing to go the extra mile for me. If it was a maintenance issue, it was promptly taken care of. If it was a personal issue, they went out of their way to help me find solutions! I loved working with you from the moment we booked till the day we said farewell. Thank you from the bottom of my heart! REPLY: Thank you so much for the kudos, it was a pleasure to have you all! The Boat House Owners Suite was beautifully appointed, comfortable, and the perfect place for two couples to spend a wonderful vacation. The internet was fast and dependable. The back up generator came in very handy when we lost power a couple of times. The home was spotless and was cleaned superbly twice during our visit. We can't wait to return! We also rented the Beach Suite below for two other couples who joined us. As I didn't stay there I can't adequately review it, but the comments from those two couples made it sound like it worked out well. It was a perfect set up for four couples to enjoy a wonderful vacation on beautiful Roatan! The only slight issue we had is the water heater is quite small when four adults all need to shower. We learned to not let the water run, and then rinse quickly, and once we mastered this technique, it really wasn't an issue, but just something for you to be aware of. It is best to conserve precious water anyway! West Bay Village is just the best area! We thank the owners for sharing their wonderful home with us! We loved every moment of our stay! The place was so clean and comfy. We made so many memories there and thoroughly enjoyed our stay! We had so much fun making meals and watching the Olympics, playing cards and just soaking up this gorgeous home. Thank you to all the staff as they were absolutely wonderful!!! Shana was efficient, and easy to work with in setting up the reservation and transport. Adjustments were made by office management when on departure day the usual road to airport was being worked on, and a detour through Sandy Bay was needed. Office offered to arrange for our visit to other attractions on Roatan. Mission Gate 3B was excellent for my brother-in-law and me for ten great days! It could have easily accommodated two couples with great cooking facilities, if you don't want to eat out every night. Nice little walk to the beach, and we were given wristbands to use facilities at Bananarama, which is a great place to park your towel on a lounge before a snorkel. They also make brick oven pizzas, and a good salad. Other restaurants a stone's throw away are Hang Over Hut, famous for its poutaine, a Canadian twist on french fries. West Bay Maul has a deli, bakery, and was very close. NicenSpicy is almost next door to 3B--shrimp tacos--I should have eaten there more--wow! West Bay Beach is beautiful, and we walked to and from West End the day we arrived. SCUBA diving on the Mezoamerican reef is excellent with coral formations. If there is a better shore snorkeling location anywhere in the Caribbean, I'd like to know! We went on two hour snorkels on days we didn't scuba. I didn't get bit by no-see-ums as I had on previous visits to the Bay Islands. I know I'll be back next year. My brother-in-law and I will make this an annual trip. The security at the property, and large number of uniformed security officers makes West Bay Beach seem like a very safe place. The Island House Rentals Property Management arranged for a pickup and drop-off for us, and we prompt on both ends. Loved it! Island House staff did a great job. Friendly, helpful and willing to assist in whatever we needed. Thanks Staff!!!!! REPLY: Thank you, Mike, we hope to see you again next year! Would love to continue our stay at Mission Gate 4C, But with the sale of the property, it may not be available. Fernando was very helpful arranging a car to rent, and when we found we weren't using it as much as thought, let us return it without problems. He even came to pick it up while we were out enjoying the vacation day. He then arranged a return taxi to the airport for us. Owner was there waiting for us, explained where everything was. Everything worked perfectly, even internet, and was remarkably clean. Every day the owner would clean the beach area and was available should we have needed anything. I cannot thank all of you enough for all your help during our stay. A special shout out to Fernando, Shanna, and Julio for assisting us throughout our stay. I always felt like I had a friend who was willing to go the extra mile for me. If it was a maintenance issue, it was promptly taken care of. If it was a personal issue, they went out of their way to help me find solutions! I loved working with you from the moment we booked till the day we said farewell. Thank you from the bottom of my heart! The Boat House Owners Suite was beautifully appointed, comfortable, and the perfect place for two couples to spend a wonderful vacation. We can't wait to return! This place has a great location-right behind Bananrama. Easy walk to the beach. Place was very comfortable and had everything we needed. We were 4 women and it was perfect for us! We will definitely be coming back! Everyone was very helpful and nice . The apt is amazing . Very clean and comfortable . The location is Amazing. 3 min walk to the beach . Couldnt be better . I look forward to staying here again. Roatan is my favorite place to recharge .... both the island and the people are beautiful. Every person I spoke with at Island House was friendly and helpful. This condo is exceptional. We have been staying in Roatan for years; this was the first time that we stayed in this condo.The fresh tropical flowers displayed in the living room were a nice touch. With 5 people staying here, we enjoyed the creature comforts of a washer/dryer, full kitchen and two bathrooms. Sunset from the rooftop of this building is stunning. It truly was the perfect place to come back to after exploring the island all day. The location is ideal. 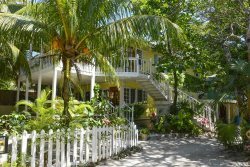 Less than 2 minute walk to the beach in West Bay. Restaurants and dive shops are right on your doorstep. The rental was very comfortable...will do it again. Your service to respond to emails and answer questions was very good, only unfortunate detail was on check out day we were expecting a driver to take us to the airport as we had a driver pick us up and given details to you on our departure. .Perhpas I missed something in print on departure?? We are gratefully to Carmela & Zoro for driving us to the airport or we may have missed our flight, trying to find a driver on a Sunday at 11:30am. It could not have been easier. No stress. Everything is taken care of for you from the moment you arrive at the airport until you depart. Fantastic organization. Safe, convenient, comfortable. Best location on the island. Fernando was amazing. Knowledgeable and super friendly. We'd have never done the snorkeling cruise without his recommendation and that was one of the best things we did. Such a beautiful property and so convenient to the beach. Quiet and close enough to say hello to your neighbors but far enough away if you didn't want to. Would stay again.